It is a great pleasure for us to inform that according to the “Elektronika” magazine report (No. 12/2012) titled “Electronic components. Domestic distribution market” TME won the first place in the survey “Which catalogue companies do you recommend?” achieving 60% of the total number of votes; and “The best distributor in Poland” with 43% of all votes. We also achieved high position in the ranking, in which the industry was evaluated by its representatives, i.e. 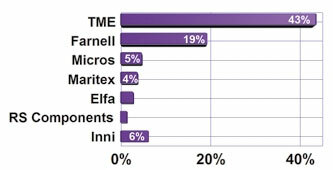 specialists working in distribution companies – in this ranking, TME achieved over 60% of indications. "The best distributor in Poland"
"The best distributor in Poland according to industry specialists"